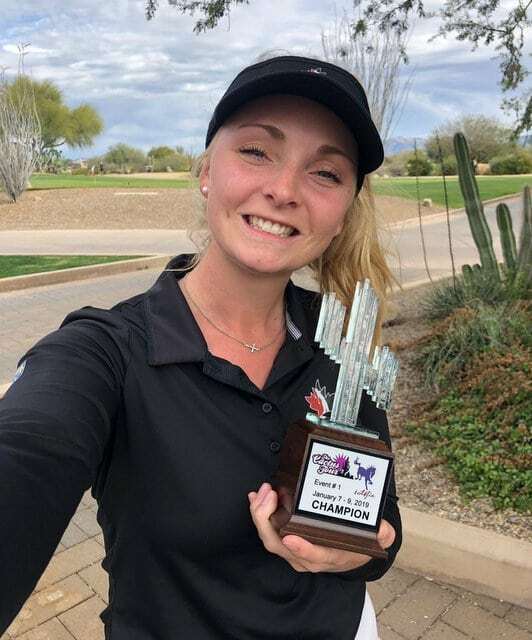 Maddie Szeryk won her first professional tournament on January 9th, taking home the Cactus Tour’s year-opening event at Wildfire Golf Club in Scottsdale, Arizona. Szeryk was then named to the 2019 Team Canada Young Pro squad only days later as she embarks on her first full season of professional golf. Szeryk graduated from Texas A&M last spring after an illustrious collegiate career. Szeryk’s collegiate golf career was highlighted by four wins. Szeryk also set multiple records including the NCAA record for rounds of par-or-better with 9,1 and the SEC record for top 10 finishes with 32. Szeryk will compete on the Symetra Tour this season where the dual Canadian-American citizen has full status in hopes of making it to the LPGA tour next season. The only other Canadian competing at the opening Cactus Tour event was Krista Fenniak from Fort Mcmurray, British Columbia. Fenniak finished at Even par for the three rounds and one stroke out of the money. Szeryk took home a $2000 cheque for winning her first professional event. Hopefully this is a sign of a strong year to come by the young Canadian. The other major Canadian golfing victory of late came courtesy of Chris Crisologo. Crisologo came from behind and defended his title at the South American Amateur Championship at Los Leones Golf Club in Santiago de Chile. The young Canadian defeated Luis Gagne on a second playoff hole after firing rounds of 72, 69, 71 and 69 (-7). Fellow Canadian and member of the National Amateur squad- Brendan MacDougall was +5 for the tournament and finished T26. This hot start to the season for many young Canadian golfers continues the trend of Canadian golf being on the upswing with more Canadians than ever competing in PGA Tour events.